Jordan & Skinner are award winning Scottish theatre makers who create playful, vivid visual theatre exploring questions of personal and political importance. The company have developed a distinctive style of performance which is visually led, often non verbal and created through a highly collaborative and ever evolving process. In 2018 we were awarded a fellowship with the Barbican and ArtWorks Alliance to develop our participatory practice. We are doing this in partnership with Platform where we are Associate Artists 2018 – 2019. Our first production Sanitise won a Scotsman Fringe First in 2014 and was an Arches Brick Award nominee. Our second show At A Stretch for young audiences won a Three Weeks Editors’ Award 2017. 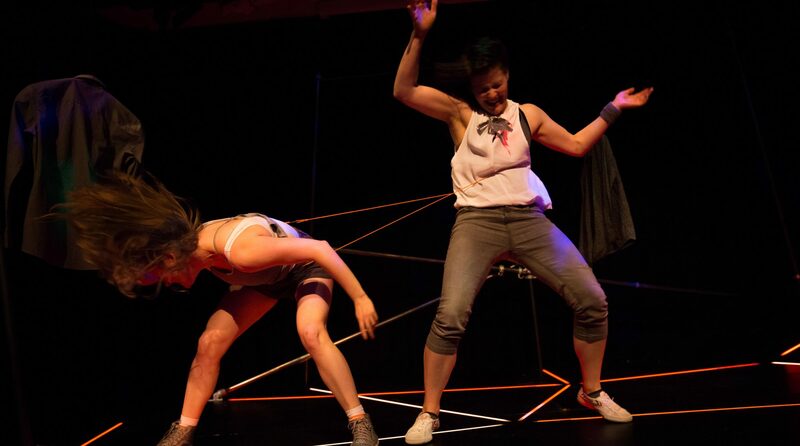 Melanie is an award winning performer, director and theatre maker based in Glasgow, creating work in theatres and on the streets which is visually driven, physically dynamic and exposes our shared humanity with curiosity and humour. Trained at Queen Margaret University and Ècole Philippe Gaulier in Paris, she is Physical Theatre Practitioner with Surge and co-founder of Clown Cabaret Scratch Night and Bouffon Scratchings. Melanie has co-created internationally touring productions with companies such as Faux Theatre, Organic Theatre, and is Associate Artist with Plutôt La Vie Theatre Company. Melanie teaches clown and physical theatre across Scotland. Recent performing credits include At a Stretch and Sanitise by Jordan & Skinner (Fringe First Award winner), Flutter by Tortoise in a Nutshell, Selkie by Kay Singh (David MacLennan Award winner), Slice by Faux Theatre/ Puppet Animation Scotland, Nassim Soleimanpour’s White Rabbit, Red Rabbit and Blank, Macbeth in Silence by Ludens Ensemble and Fraxi Queen of the Forest, Asylon Theatre. Melanie also writes and performs in various clown and cabaret acts. Caitlin trained in Edinburgh and New York and specialises in creating urgent, bold and generous theatre for a range of audiences. As well as her work with Jordan & Skinner Caitlin is Artistic Director of new writing pub theatre company Village Pub Theatre and Director with new touring theatre company Pearlfisher. Her directing credits include Woke (Apphia Campbell/Edinburgh Fringe), Hair of the Dog with Village Pub Theatre (Village Pub Theatre, Traverse Festival) The Strange Case of Jekyll and Hyde (Lung Ha Theatre Company), Sanitise (Jordan & Skinner, Winner of 2014 Scotsman Fringe First Award) Selkie and The Happiest Day of Brendan Smillie’s Life (A Play, A Pie and A Pint) and Noye’s Fludde (Lammamuir/McOpera). Caitlin was dramaturg on As the Crow Flies (Greg Sinclair/Imaginate) and rehearsal director for A Stone’s Throw (Giddy Aunt). Caitlin has worked as Assistant Director with National Theatre of Scotland (The James Plays, Our Ladies of Perpetual Succour, Driver’s Seat) Dundee Rep (In My Father’s Words) Traverse Theatre (Breakfast Plays) and Royal Lyceum Theatre (Cinderella).